These Odyssey people are really trying to make us better putters. Remember, they brought us a face insert that everybody loves and many other companies have tried to imitate. And likewise, this is the company that invented the two-ball putter, another incredibly successful ingenuity that many other brands have copied. The Backstryke is another great idea. 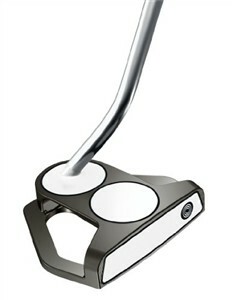 Odyssey has taken their two-ball putter and attached the putter shaft to the back of the putter head. You have to check this out -- it isn't just a gimmick! First, with the shaft in the back, you now have more visibility of the ball and your line. The new site line is definitely a little weird at first but once you try it, you may never go back to your traditional putter. The thing I like best about the putter is it forces you to get your hands forward and start your stroke with a forward press. For those of you who don't know what a forward press is -- your world is about to change. The forward press is when you start your stoke by moving your hands forward. This gets your hands in the correct position, leading the putter head. Your hands should always lead the putter head because this imparts a bit of top spin on the ball and gets the ball rolling sooner and skidding less, resulting in a truer roll. At the time of this review, the Backstryke design is available in three different putters: the Two Ball, the Marxman, and a Blade Putter. I like the Marxman the most because it has a great alignment aid, and the Two Ball has none. The Blade putter just looks too weird.